At the height of the summer, it’s worth taking a look at how Stirling provided souvenirs for tourists in generations past. It is often said that modern tourism in the Stirling area began with the publication of Walter Scott’s Lady of the Lake in 1810. By 1814, when his novel Waverley was published, the Stirling and Trossachs tourist trail was well established. 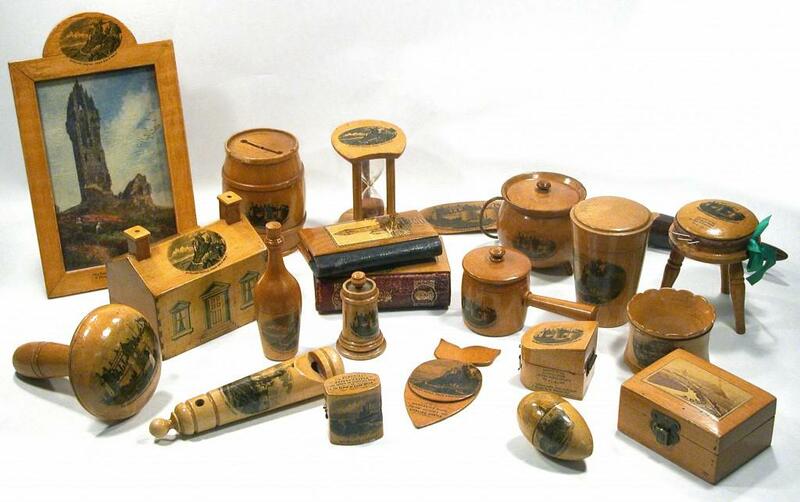 The production of souvenir wood ware for the tourist market began in the 1790s with the snuff box industry in Ayrshire. By 1820, Mauchline ware was well established, supplying souvenirs from wood grown ‘on the Field of Bannockburn’, ‘on the Abbey Craig’, ‘on the slopes of Stirling Castle’ and made into sewing requisites, egg cups, trinket boxes and many other kinds of souvenirs, transfer printed with a line drawing of the place. The industry was based in the town of Mauchline and lasted until about 1930. At its height in the 1850s, four of the major manufacturers maintained showrooms and offices in Birmingham, and supplied visitor sites world-wide. Stirling made its own contribution to the industry. The mechanism for printing tartan on to wooden surfaces was developed with the help of Wilson’s Mills, Bannockburn. Collecting Mauchline ware is a global activity. This collection was bequeathed to the Stirling Smith Art Gallery and Museum by retired pharmacist, Betty Meikle OBE (1928 – 2013) of Stirling, and is on display.